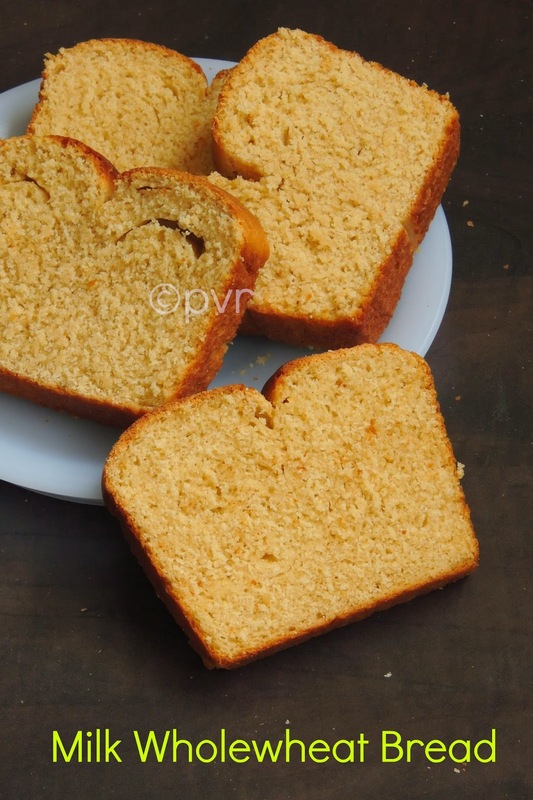 This is definitely an easy and spongy bread, one can have it happily during anytime of the day.Make this loaf bread easily at home with Indian chappathi flour, yes i used Aashirvaad atta. If you still want to replace it with an organic wholewheat flour just go on. 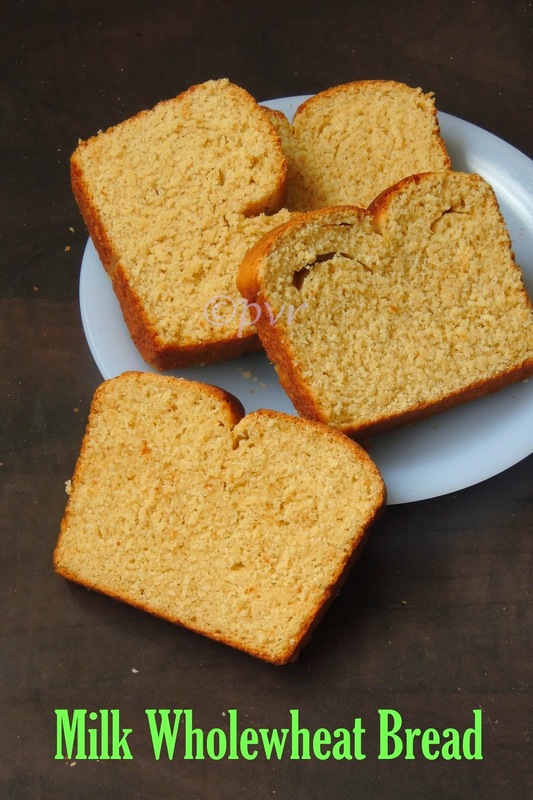 However i love to add aashirvaad atta in my wholewheat breads, this Indian chappathi flour works absolutely wonderful in breads as well as in wholewheat cakes. My theme for this week's blogging marathon is Tame the yeast, after a No knead wholewheat loaf bread, today am posting this fabulous milky wholewheat bread for this week's theme.This bread was baked and suggested by Mireille of East West Realm.Check out the Blogging Marathon page for the other Blogging Marathoners doing BM#43. Heat the milk, water, honey and butter until the butter melts, keep aside and let it cool to luke warm. Add the yeast and give a stir, leave aside for 10minutes until the yeast turns foamy. In a large bowl combine the all purpose flour,salt and half cup of the wheat flour,mix with a spatula. Slowly add the rest of the flour and knead everything as a soft dough for 10minutes, place it in a greased bowl, cover with a plastic wrap and arrange it in a warm place for an hour. Grease a loaf pan generously and keep aside. Punch down the dough and divide the dough into two balls. Roll each balls as a rectangle, starting from the narrow end , roll the rectangle as a log. Place the seam side down in the prepared loaf pan.Place the rolls side by side, cover it with a kitchen towel, leave aside for 40minutes. Preheat the oven to 350F, bake for 30-35minutes until the crust turns golden brown. Brush the top of the loaf with melted butter. Remove from the pan, cool completely before slicing. Enjoy with your favourite spread. Milk Bread looks so soft and light. Glad to follow you priya... would be glad if you could drop by my space at your leisure!!! Such a lovely loaf of bread. Healthy and perfect for breakfast! The bread looks superb! Gr8 way to start the day.. Perfectly made bread, looks so soft! looks beautifully done,Priya..Though I tried this smtym back but couldn't get it perfect like this,will try again ! The shape of the bread is so perfect and it looks spongy and soft. super perfect wheat bread sis!!! Fulfilling and delicious looking bread. Excellent preparation. Looks interesting....... Healthy and yummy bread!! Yum, I might try this variation of wheat bread soon. Wow the bread seem to have turned out a winner...very nicely baked Priya.. The two trial breads have come out perfectly. I loved baking this bread. Yours came out perfect. We loved this bread too. Came out great! Perfectly baked loaf yet again!